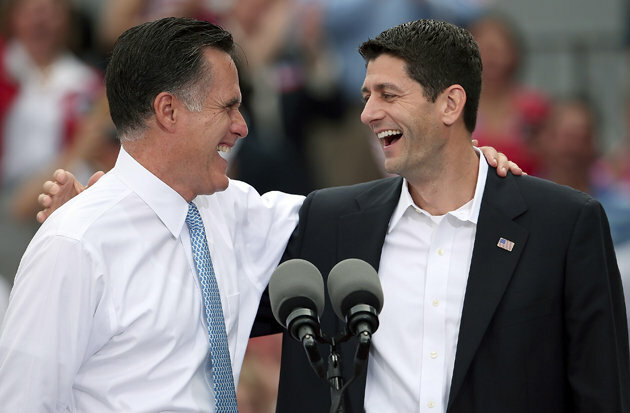 They look happy, Mitt Romney and Paul Ryan, but it’s hard for me to see how Romney’s choice of Ryan as his running mate will strengthen the Republican ticket, increase its chances for victory, and bring joy for the party in November. Yes, the choice will energize the far right in the party — the born-again Christians and the Tea party, who will now feel more motivated to actually turn out and vote. That’s not bad, of course, but beyond that? Not much. Ryan is not broadly known and has no strong geographic base. It is unlikely that he will succeed in helping Romney carry his home state of Wisconsin in the fall. And his view of America, based on his budget proposal that he persuaded his fellow Republicans in the House of Representatives to support, is too radical and too controversial for the broader electorate. But the former Governor of Massachusetts, seen by many as a moderate voice in the Republican party, is now closely associated with that budget, and he will not be spared in the coming months. But the simple truth is that his plan is not an evenhanded attempt to solve America’s long-term budget problems. It’s a profoundly radical document, its proposals skewed by ideological biases. Raising taxes, of course, is out of bounds. The same goes for using federal power to hold down Medicare costs, which will be the key driver of future budget deficits. Instead, House Republicans would cut spending on almost everything else the government does. In naming Congressman Paul Ryan, Mitt Romney has chosen a leader of the House Republicans who shares his commitment to the flawed theory that new budget-busting tax cuts for the wealthy, while placing greater burdens on the middle class and seniors, will somehow deliver a stronger economy. The architect of the radical Republican House budget, Ryan, like Romney, proposed an additional $250,000 tax cut for millionaires, and deep cuts in education from Head Start to college aid. His plan also would end Medicare as we know it by turning it into a voucher system, shifting thousands of dollars in health care costs to seniors. As a member of Congress, Ryan rubber-stamped the reckless Bush economic policies that exploded our deficit and crashed our economy. Now the Romney-Ryan ticket would take us back by repeating the same, catastrophic mistakes.